Figure 1: Russian international reserves ex.-gold, bn.USD (blue, left scale), and end-of-quarter exchange rate, USD/RUB (red, right line), down is depreciation of rouble. Dashed line denotes beginning of sample in Figure 2 below. Source: IMF, IFS. Next consider a shorter span (corresponding to the period after the dashed line in Figure 1, ending April 2014), at a monthly frequency. Figure 2: Russian international reserves ex.-gold, bn.USD, end-of-month (blue, left scale), and end-of-month exchange rate, USD/RUB (red, right line), down is depreciation of rouble. Source: IMF, IFS. Both series correspond to end-month. Note the rapid decline in reserves ($14.8 billion in April), even as the ruble has stabilized (note further the policy rate has been raised to 7.5% already). 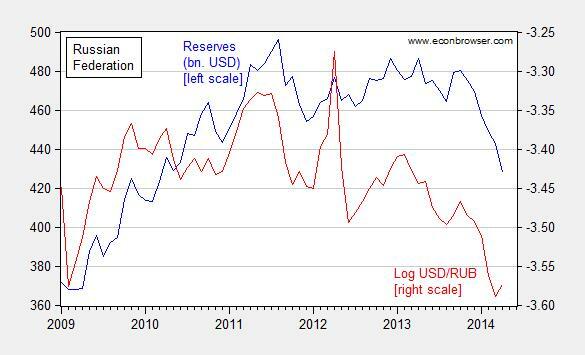 Are Russian reserves high or low? That depends on the context. Figure 3 plots the time series of reserves to short term debt (an important variable for determining whether a country suffered a big growth deficit during the global financial crisis, according to Bussiere et al. (2013)), and relative to M2. Figure 3: Russian international reserves ex.-gold, bn.USD to short term debt (blue, left scale), and reserves to M2 (red, right line). Source: IMF, IFS, and author’s calculations. The reserves to M2 ratio is of interest because (following Calvo) M2 is approximately the amount of bank deposits that are sufficiently liquid that they could leave the country. 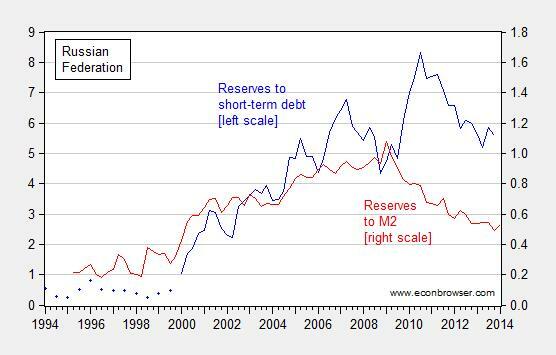 The reserves to M2 ratio has been declining, just like the reserves to short term debt ratio. 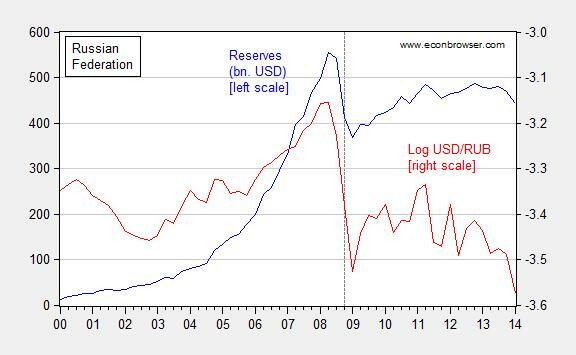 The reserves to M2 ratio is now below 60%. Now, it’s hard to say whether this is a “low” number. By the standards of the countries embroiled in the East Asian crises of 1997, the 60% is pretty high (Thailand was at about 27% at end of 2006, Korea at 16%). On the other hand, capital account openness (as measured by the Chinn-Ito financial openness index) is higher in Russia today than it was in either of those two crisis countries in 1996. The fact that the capital outflow is so marked  is consistent with this view. So, on the basis of short term debt coverage, Russia seems fairly secure. The fact that it runs a current account surplus is also very helpful. On the other hand, if the ratio of M2 to reserves continues to decline, then the situation might be come more worrisome for Russian economic policymakers (and a heightening of the VIX would probably not help). This entry was posted on May 29, 2014 by Menzie Chinn. who could be overrun by Soros (who “broke the Bank of England” in 1992 already) and the like in a second run any minute.